Some confusion exists around the terms malabsorption, intolerance and allergy. They are quite different and in particular, we should never confuse Fodmap intolerance with Fodmap malabsorption. One is very serious while the other is much less so. In this video, I explain the difference between the three terms. Today I want to talk to you about the difference between malabsorption, intolerance and allergic. There can be a little confusion around these. We malabsorb FODMAPS, which means we absorb a certain amount but not beyond that certain amount, and that’s individual for all of us. I’ve had some questions in the club about things like mouthwash that has sorbitol in it or other products. I think meat being cured with celery juice was one, and anyway, we can have a quarter of a stalk of celery. But when there’s just those traces of something that’s on the not permitted list, that’s going to be fine because we will absorb that amount. It’s just that if there’s too much that we have our problem. There is such a thing as FODMAP intolerance. We don’t have that. FODMAP intolerance comes from birth. Someone is born with a FODMAP intolerance and, as you can imagine, that’s very dangerous because we need FODMAPS. They’re in all fruits, vegetables and grains and to cut out all FODMAPS, we have to cut them all out so that is actually life-threatening. We do not have FODMAP intolerance. We malabsorb FODMAPS. If we had an allergy to something, that would actually be something like an allergy to peanuts where the person gets a really serious reaction and ends up in hospital. Maybe their throat swells up, they come out in a rash – that’s an allergy and again, that can be life-threatening. We don’t have that. 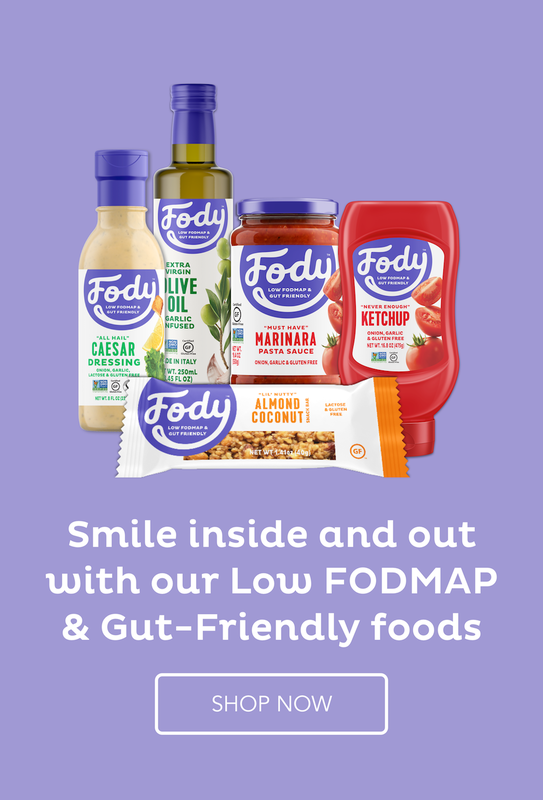 You as individuals might have your own little allergies or intolerances, but it’s got nothing to do with FODMAPS. We malabsorb them. We can absorb some, but not beyond a certain amount and how far that certain amount is, is individual to each of us. If you see traces of some FODMAPS in foods, don’t worry too much about that. I just wanted to let you know how much your tutorials mean to me and I’m sure to all IBS sufferers. They are so helpful in this maze of information about such a complex condition. Every time I read one of your emails I learn something new. Thank you. Thank you so much for letting me know, Sue. It’s lovely to get feedback like that. Why after eating every thing for so many years, now in my later years why do I have a problem with so many foods? I just don’t understand it? Fructose is a big problem? You can get IBS at any stage in life. Allergies can also develop as you get older. Now after years of eating everything, I have high stomach issues, including nausea? IBS and allergies can develop at any age. Also, reflux (the probable cause of the nausea) is more likely as you get older. Our bodies simply don’t perform as well as we get older – just like any piece of machinery.